UMB honours the 65 doctors who were awarded their doctoral degrees during the academic year 2011/2012. The annual Doctoral Degree Graduation Ceremony is held this Friday. 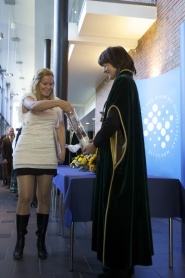 The University of Life Sciences (UMB) will honour the 65 doctors who were awarded their doctoral degrees during the academic year 2011/2012 at the Doctoral Degree Graduation Ceremony Friday 14th September, at 1 p.m. at the Arabidopsis auditorium at the Biotechnology Building. Read the programme here! The graduation ceremony is open to everyone wishing to participate. Dress code is semi- formal. UMB wishes to thank each and every one of the doctors for their effort and contribution to UMBs research. 36 of the 65 doctors will be present at the ceremony. Sr. Research Fellow Eirik Romstad, UMB Scool of Economics and Business will give an address to the doctors. Rector Hans Fredrik Hoen and Pro-rectors Mari Sundli Tveit and Ruth Haug will present the Doctoral Degree Diplomas. Ph.D Anne Chapuis, Department of Mathematical Sciences and Technology will give an address from the doctors. Globetrotter and humourist Arne Hjeltnes lectures on “Norwegian Food on a Global Plate”. A research project will be presented by one of UMBs two Researcher Grand Prix 2012 finalists: Ph.D student Anicke Brandt-Kjelsen, Department of Plant and Environmental Sciences. After the ceremony in Arabidopsis auditorium, doctors and the audience proceed to the lobby, where the doctors will "sow the seeds of knowledge". The ceremony starts in Arabidopsis auditorium in the Biotechnology Building at 1 p.m. on Friday 14 September and ends approximately at 3.30 p.m., when the doctors and their invited guests proceed to the banquet in the Economy Building.